Our Industry Partner, the Dearborn REALTIST Board® (DRB), is focused on increasing Chicago’s Black homeownership. Throughout 2019, DRB will host a series a of community wealth-building days to provide Black families with the information they need to buy a home. 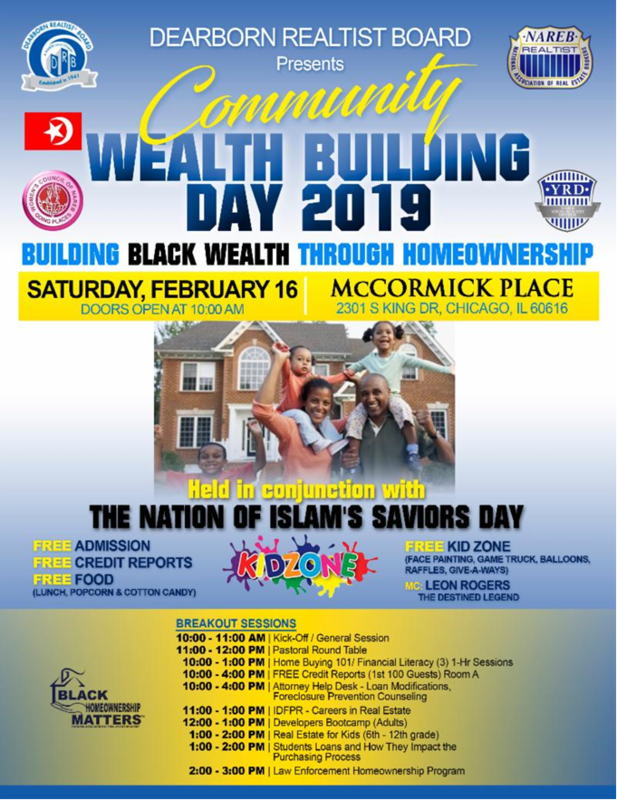 Join the first wealth-building day of 2019 on Saturday, February 16th at 10 AM in McCormick Place. In a round of break-out session, attendees will learn about credit reports, lending, real estate opportunities and careers and more. Students are encouraged to attend. DRB’s wealth building days are part of the larger National Assocation of Real Estate Brokers’ “2Mn5” initiative, which aims to help 2 million Black families become first-time homeowners within five years.